This power–saving alternative to a traditional ray box is portable and durable. The low-power LED mounted inside this metal ray box prevents heat buildup for added safety over extended periods. The unit operates on two AA batteries and is fitted with two 4 mm sockets for the battery pack, which is easily mountable on the ray box. 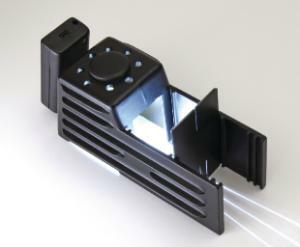 Ordering information: This box includes a collimating lens and slits with accommodating slots in integral side rails. Two AA batteries are required but not included.